How the Irish used every part of the pig to create varied and resourceful dishes. Anyone who has ever visited Ireland has encountered one of the nation’s legendary feasts: The Irish Breakfast. When I was a child, my journey to enjoy that treat was a lot shorter. All I had to do was roll out of bed on Saturday morning and go downstairs to the kitchen of my family’s Philadelphia row house. Unless he was shooting a wedding, I’d find my photographer Dad doing his “King of the Kitchen” thing and whipping up his special weekend morning meal of eggs sunny-side up, fried potatoes, sautéed mushrooms, toast with butter and jam, coffee with sugar and cream, and a plate piled high with bacon, sausages, or slices of ham. Decades later when I began writing about Ireland’s food traditions, I discovered Dad’s Saturday cooking extravaganzas were not just one of his endearing culinary quirks, but evidence of his Irish heritage. His mother had been raised in Northern Ireland, a region once known as the Kingdom of Ulster, where a meal like Dad’s breakfast was so popular it was simply called an Ulster Fry. In Ireland, no part of the pig would go to waste. 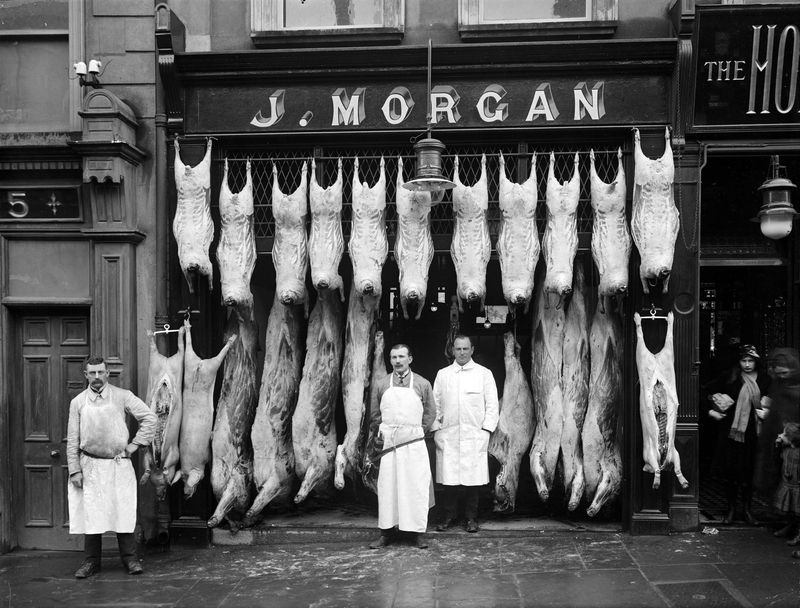 J. Morgan’s Butchers, Broad Street, Waterford, 1916. Mind you, an Ulster Fry wasn’t something served only on special occasions. It was eaten at any time of day and often, because every element was commonly at hand in every cottage pantry – eggs from the family hen, potatoes from the garden, mushrooms foraged in nearby woodlands, wholemeal bread baked on the turf hearth, butter and cream from the family cow, homemade jam from local fruits, and a variety of pork products harvested from the family pig. While every household, large or small, had at least one cow and one pig, the cow was more valuable for its constant supply of dairy products and beef was a rare treat in all but wealthy homes. Pigs, especially sows that could produce many piglets, were kept specifically for the meat they provided, and pork was the average family’s primary source of protein. 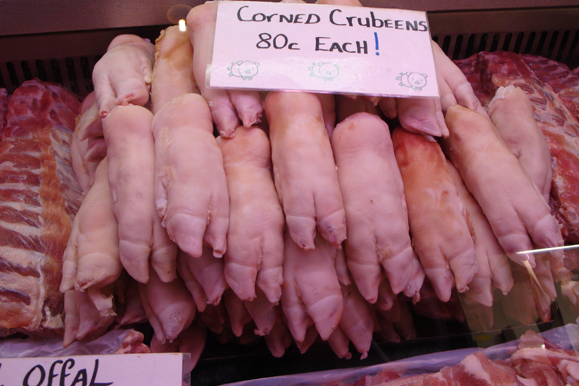 Pigs feet, or crubeens, at the butcher. Immediately after slaughter, the women began preserving the parts that would spoil most easily and quickest. The intestines were carefully emptied and flushed with fresh water to be used as casings for sausages and sausage-like “puddings.” Every drop of blood was caught and mixed with onions, lard, spices, oatmeal and flour to be transformed into Ireland’s famous black puddings. Trimmings that were cooked, minced, and mixed with more oatmeal and spices, became white puddings. After the pig’s head was boiled for hours, the tongue and every scrap of meat was chopped, returned to the liquid with pepper and spices, placed in a mold, and left to gel into a sliceable delicacy called “brawn.” The stuffed and roasted stomach, known as “poor man’s goose,” and fried liver with onions made fine dinners, as did the heart when it was sliced and stewed with onions and vegetables. The “trotters” (feet) were boiled and roasted to make “crubeens,” or, with the addition of a bit of vinegar, became a tangy dish eaten cold. Once all the fat was collected, it was rendered into lard that would be used for frying and making flaky pie pastry. Fried in bubbling lard and sprinkled with salt, the pig’s skin became crisp “cracklin” that was a treat for young and old alike. While the most perishable parts of a pig were either preserved or eaten straight away, the several hundred pounds of meat remaining were quickly butchered and salted as “bacon.” This generic Irish term for most cuts of cured pork confuses the heck out of Americans who only think of bacon as something served with fried eggs or in a B.L.T. Melt butter in a small saucepan over medium heat. Add flour and stir to make a loose roux. Cook, stirring constantly, until the roux is golden – do not brown! Add broth slowly and stir to blend. Still stirring, add hot milk gradually and cook until thickened. Add parsley and stir to combine. Serve hot. Makes 2 cups. Preheat oven to 350º F. Score top of ham into diamonds and press a clove into the center of each diamond. Place ham on a rack in a roasting pan and bake for 11⁄2 hours. In a bowl combine the sugar, mustard and cider and spread glaze evenly over ham. Bake for another 35 minutes Transfer ham to a platter and let rest for 15 minutes before carving. Serves 12. Preheat oven to 350º F. Boil a kettle of water. Put the bacon and sausages in a saucepan and pour in enough boiling water to cover. Bring back to a boil, then reduce heat and simmer for five minutes. 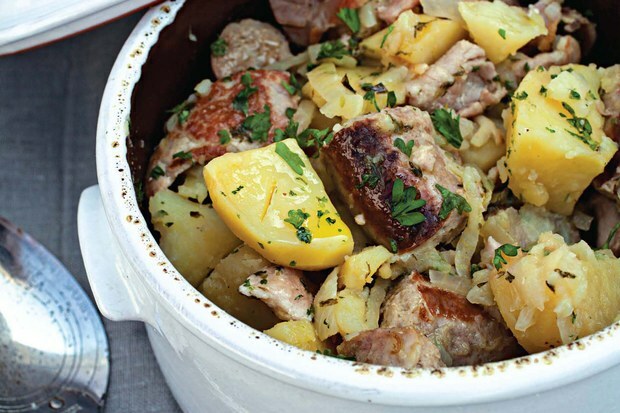 Remove the bacon and sausages to a greased oven-proof casserole and save the liquid. Place the potatoes and onions on top of the sausages and bacon. Pour in enough reserved boiling liquid to cover. Season with salt and pepper. Cover tightly with aluminum foil or a lid. Place casserole in the oven and bake for one hour. Serves 4.